Good question. What is this? It does have elephants, that's what we know. And you can ride them, too. This one is a bit of an adventure: we're not even sure what to call this place. But have you ever wanted to ride an elephant trough the Keralan jungle? Here you can. Or you fancy seeing traditional Keralan wooden architecture? That's on display too. 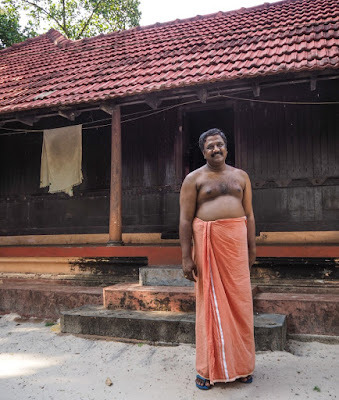 Or you want to shoot the breeze with potbellied Indian men wearing a lungi (sarong)? Yup, that's available as well. About 20 minutes north of Alleppey (Alappuzha) in Kerala. Map. 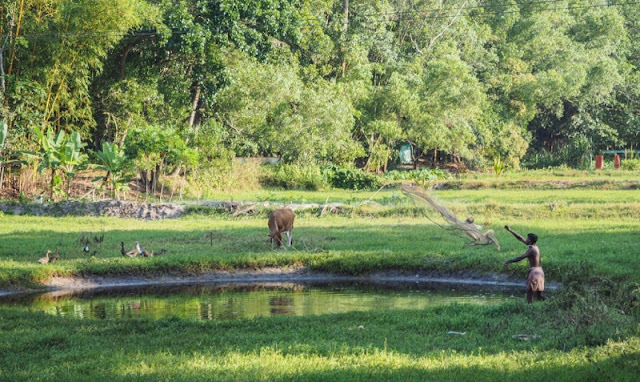 "This small elephant camp near the north end of Punnamada Lake offers elephant experiences from 30 minutes to two hours. The longer sessions include feeding, bathing the elephant and a trunk shower." It had a phone number, but no address, no directions, and definitely wasn't marked on any of the maps. When a possible tourist attraction becomes this hard to pin down, our resolve grows: our eyes turn misty, and we find ourselves mumbling 'must...visit...now'. 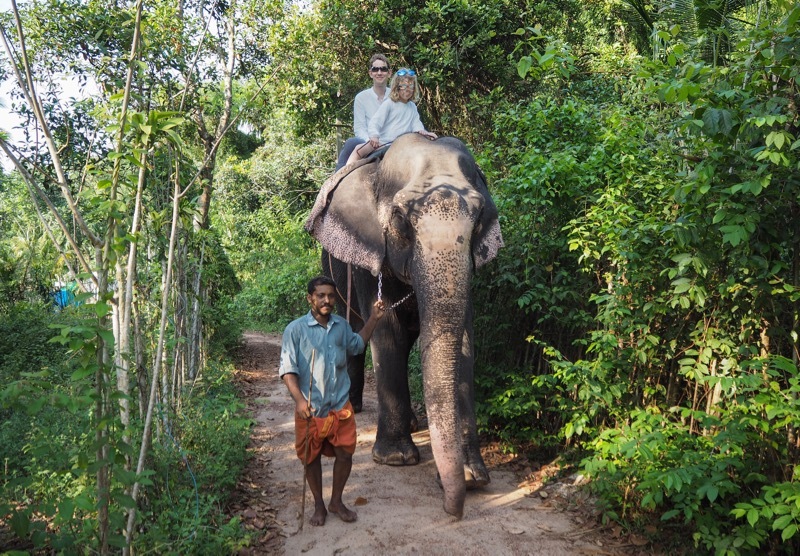 So we chartered a car with driver, put him on the phone with the mysterious Elephant Camp, and off we went. 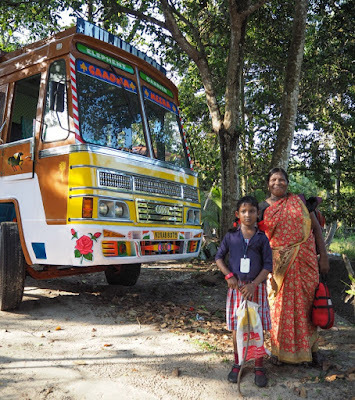 Amazingly, although it involved a few detours and stops to ask for directions (by now you will have figured this attraction is NOT well signposted) we arrived in the green village of Kattoor, about 10km north of Alleppey. A bunch of bare-chested men in colourful lungis welcomed us and gave us an affirmative head wobble: 'Elephant is there'. Indeed, several massive beasts were hovering nearby, chained to a palm tree. And for the right amount of baksheesh, a ride could be arranged. Cash only of course. So off we went! 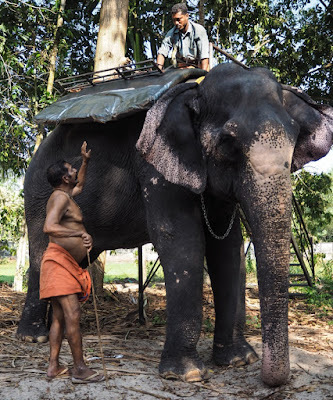 What was equally interesting was the house where these mahouts (elephant handlers) were dwelling. 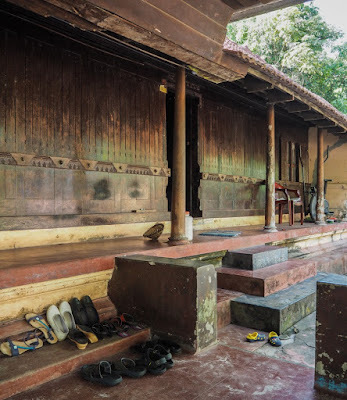 In one of these #IncredibleIndia moments, this turned out to be a more than 100 year old wooden bungalow, finely decorated with carved wood and with an elegant porch made for hours of unproductive lounging in the shade. A great place for siestas. 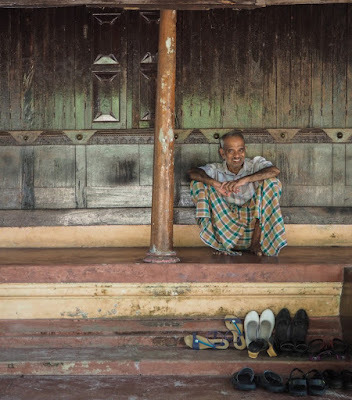 Leisurely lounging in your lungi. We tried to find out what the deal was here. Surely this was not a bona fide tourist attraction? (Although, surprisingly, a middle class family from Delhi showed up in a rickshaw, two chubby kids in tow, also dying for a ride.) 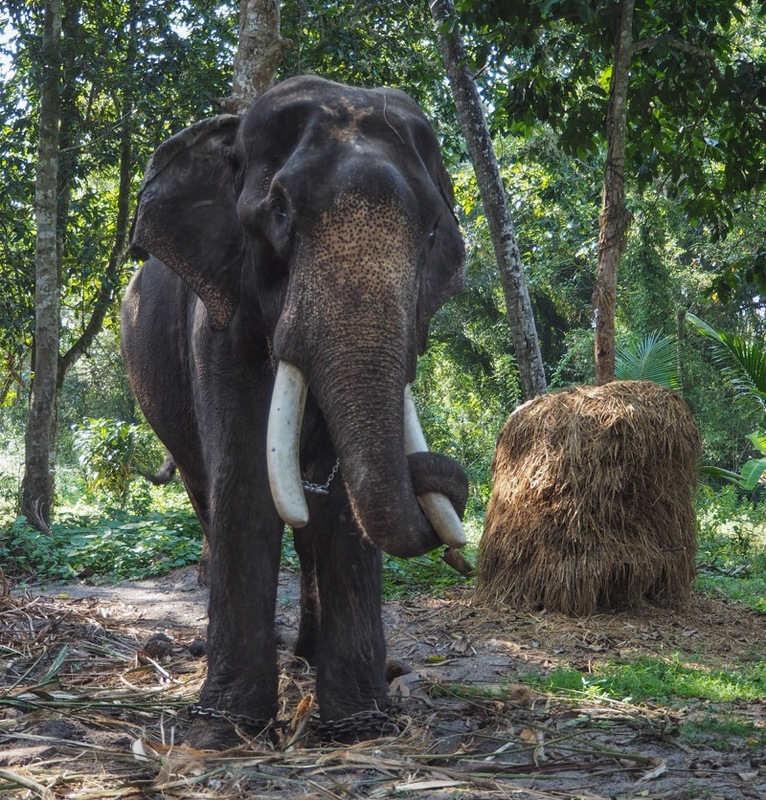 The best answer we got was that these beasts were used for temple festivals, for processions and blessings, and that when they weren't gainfully employed, they came here to rest and moonlight as kids' rides. 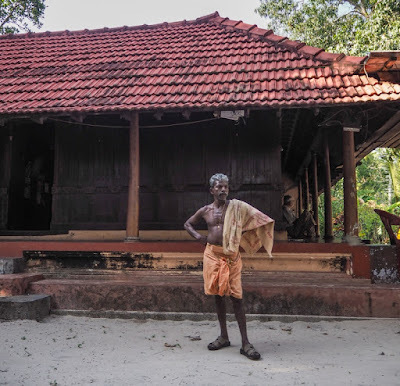 Anyway, to cut a long story short: if you're looking for a ride on a holy elephant, and you are up for discovering a bit of traditional Keralan architecture and village life, this is a rewarding visit from Alleppey. Just be sure to call ahead and bring a Malayalam speaker. Well, there are no signs, no official address, and no website. But here are the exact GPS and Google Maps coordinates. Which should be enough to get you there. The phone number we called was +91 9249905525. Give it a shot!